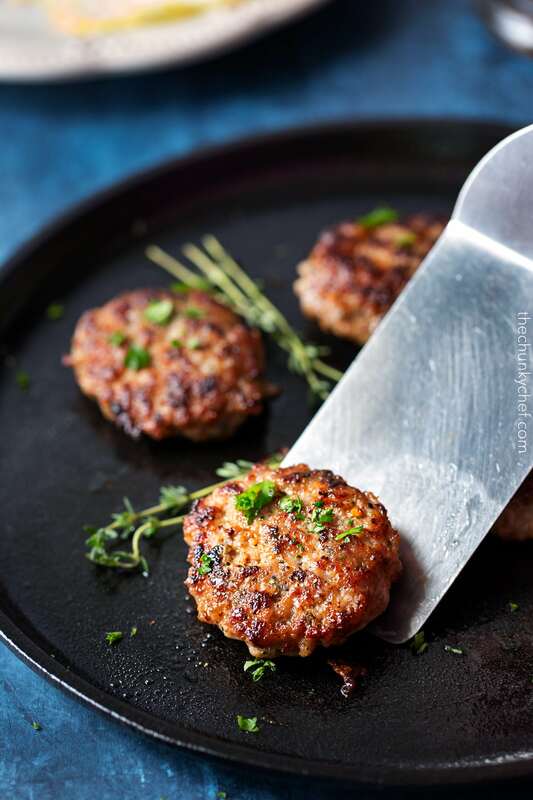 This recipe for homemade breakfast sausage is low in calories, made with a combo of pork and turkey, they’re the only kind of breakfast sausage you’ll need! Usually breakfast sausage comes from a pouch at the grocery store, but today I’m sharing a fantastic way to make it at home, using simple ingredients! Once you’ve made the patties, you can easily freeze them… or cook them first, then freeze, for a quick, on-the-go breakfast idea! Sausage… ahhhhh sausage. I hate a love/hate relationship with it. My food weird-ness won’t let me enjoy any sausage with a casing, so usually links are out, but patties are another story! I’ve been toying with the idea of making my own sausage at home, so I could control the quality of ingredients, not have fillers, etc., but decided I should take it one step further and go for a breakfast sausage patty! And not just ANY breakfast sausage… one with a mouthwatering combination of pork, turkey, fresh herbs, seasonings and maple syrup. Ohhhh yes… can’t forget that maple syrup! Around here, if you take a quick stroll down the breakfast meats aisle at the grocery store, there are TONS of maple sausages available. There’s something about that little touch of sweetness that really takes the meat to a whole new level. I also wanted to make these a bit on the lighter side, so you can totally have more of them right?! Wait… that’s not how dieting works is it? Hmm, this is why I’m the “chunky” chef you guys… I pretty much always need more food lol. 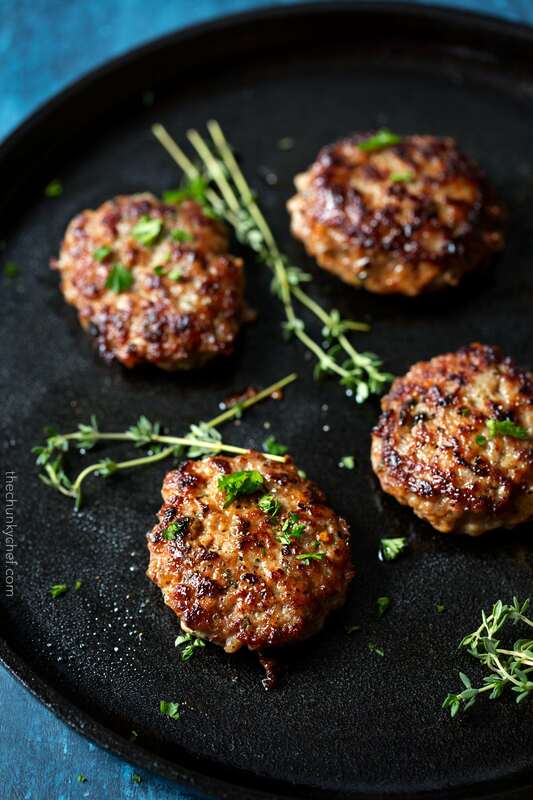 But anyway, making these with half ground turkey cuts the calories, then the ground pork comes in to add moisture (and flavor) so the patties aren’t dry and sawdust-tasting (you know how some all-turkey products can be, sadly). I can’t take all the credit for this recipe, as I got the idea for it from a Cooking Light magazine (the February issue I think? ), then made a few tweaks, but nothing major, as they pretty much had it perfect from the get go. 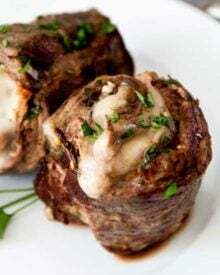 If you want to freeze them (cooked or uncooked), check out the recipe notes section at the bottom of the recipe – I’ll have directions for both methods there. Homemade buttermilk biscuits – you CAN’T beat that homemade flavor and texture! Oven roasted breakfast potatoes – you all have loved these potatoes and left some pretty awesome reviews! Vanilla Cinnamon Buttermilk Pancakes – or go crazy and try these Lemon Ricotta Pancakes! Mixed Berry Oatmeal Souffle – a bit unexpected, yet absolutely delicious! Overnight Breakfast Strata – instead of making patties, brown and crumble the sausage and use it in this recipe for a world-class hit! My favorite way though, is a classic sausage biscuit! 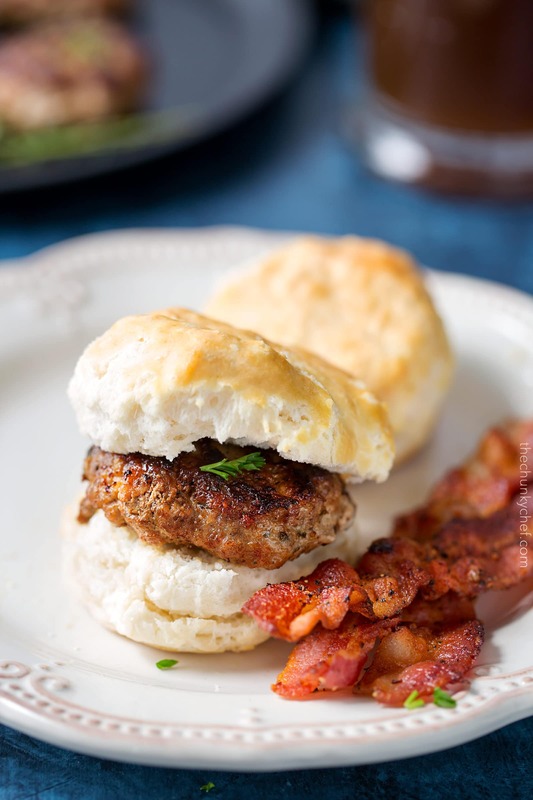 I hope you all give these Homemade Maple Breakfast Sausage patties a try, and soon! 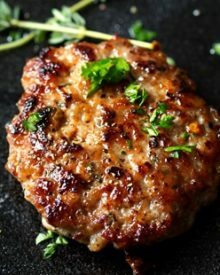 This recipe for homemade breakfast sausage is low in calories, made with a combo of pork and turkey, they're the only kind of breakfast sausage you'll need! Line a rimmed baking sheet with wax paper sprayed lightly with cooking spray, set aside. 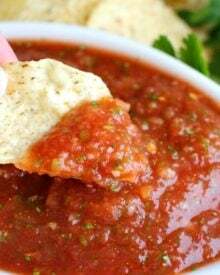 Add all ingredients to a large mixing bowl and use hands to mix until just combined. Spread mixture in an even layer in the prepared baking sheet, about 1/2" - 3/4" thick (this can be adjusted if you prefer a thicker patty). Spray the rim of a 3 1/2" biscuit cutter (or large-mouthed drinking glass) and cut out patties. 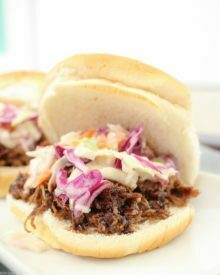 If patties are having a hard time staying together, place on wax paper in the freezer for 5-10 minutes before cooking. Heat vegetable oil (about 1-2 Tbsp) in a large skillet over MED to MED-HIGH heat. Add patties to pan, making sure they aren't touching (you may have to cook in batches), and cook 2-3 minutes per side, until golden brown and cooked through to a temperature of 165 degrees F.
Preheat oven to 400 degrees. Line a rimmed baking sheet with foil and place patties, not touching, on the sheet. Bake for 10 minutes, flip patties over, and bake an additional 5-10 minutes, until golden brown and cooked to 165 degrees F. --- this method isn't exact, as the times will change depending on the thickness of your sausage and your oven type. But it's a great way to cook all the sausage at once, with no oil spatter! Line baking sheet with wax paper and place cut out patties on sheet, not touching, and in a single layer. Flash freeze them by placing them in the freezer for about an hour, or until frozen to the touch. Remove patties from baking sheet. Wrap frozen patties with wax paper and place into a large re-sealable freezer bag. Freeze for up to 3 months. TO THAW - remove amount of patties that you want, and place in the refrigerator overnight to defrost. Cook as directed in recipe. Cook as directed in recipe, then allow to cool completely. Place cooked patties on a wax paper lined baking sheet, in a single layer, not touching. Flash freeze them by placing them in the freezer for about an hour, or until frozen to the touch. Remove patties from baking sheet and place in a re-sealable freezer bag. Freeze for up to 3 months. TO THAW/COOK - Place amount of patties you want in the refrigerator overnight to defrost, then microwave in 30 second intervals until heated through. WOW!!! These are absolutely delicious! 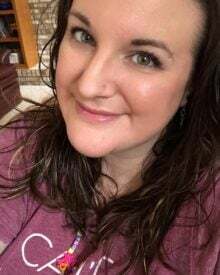 My husband & I both loved them. Thank you for sharing! Today is the second time i made them. First patch turned out good but i found that this time they came out better? its funny. cut squares of wax paper 1/2 the roll length wide and equally as long. 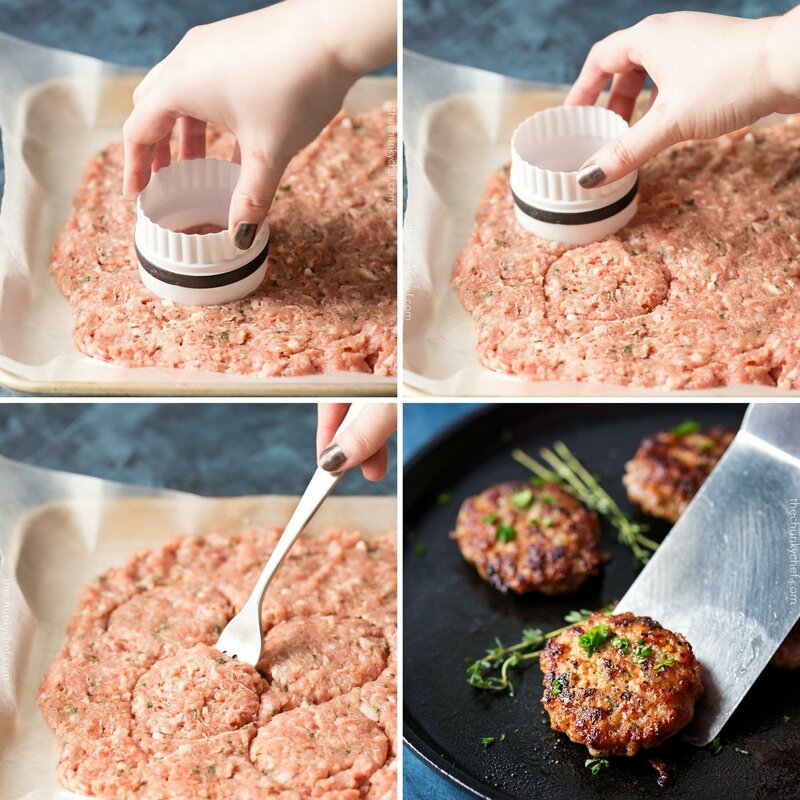 Put scoop of meat in the center of 1 square, cover with 2nd sheet.. and squish it flat with a pot, frying pan, rolling pin etc to make it a bit larger than an english muffin. Set aside and repeat until meat is gone. Stack, put in a cracker box, tray, etc and freeze. Now you can take out 1 or 2 or 3 or 4 depending on how many you need each morning. You can fry right from frozen on low-medium heat turning once. You want the patties a bit larger than your english muffin to allow shrinkage thereby avoiding your man looking puzzled and saying “Where’s the meat?” Yeah, men are simple creatures. You get them with your looks but keep them with your cooks. I’m 54 and I figure “Hi, can you cook?” is a perfectly valid pick up line. lol. Any reply other than yes, is the wrong answer. You can obviously cut them to any size you want… that’s the beauty of a recipe, it’s a guideline that you can adjust per your tastes. And no, I’m married with 2 children. 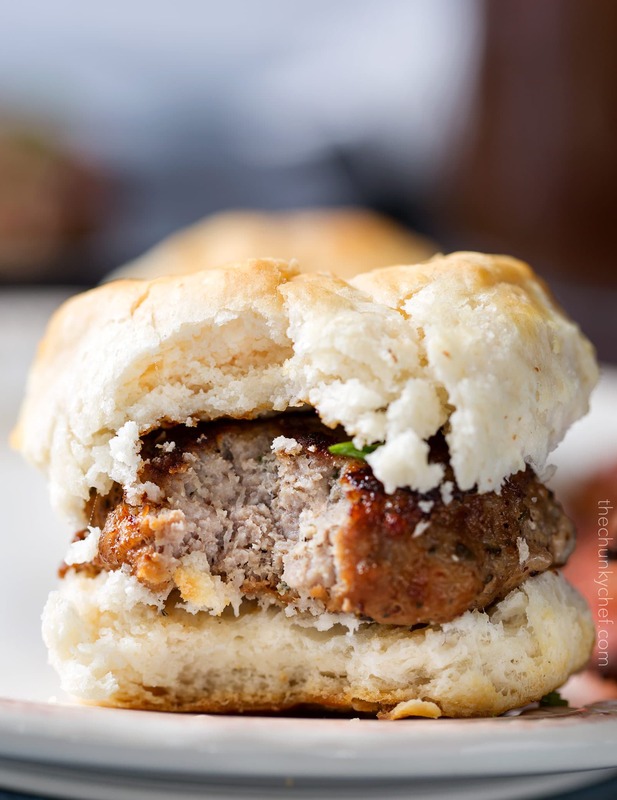 We like these sausage patties just the way they are, “girly” or not. Everyone has different tastes, in food, and humor. Is the 132 calories for 2- 2oz patties? Hi Judy… the 132 calories is for 1/16th of the entire recipe. About how many patties does this recipe usually make for you? My family are not maple sausage lovers….purists, I guess. Could I leave the maple syrup out and replace it with a different liquid? Made this sausage mix to put in a breakfast bake/casserole. It was so delicious!!! I will definitely make it again and try patties. Thank you for sharing the recipe. I made it as instructed and it was perfect. As someone who has never made a sausage in their life, this really opened my eyes in terms of taste and price. I just made these (the crumble version) over the weekend, and they’re just as good as what I had been buying frozen for about 7x the cost! Thank you. 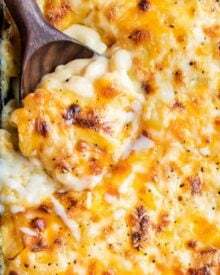 My entire family adores this recipe! It’s so good, freezes well and is healthier and cheaper than the prepackaged stuff. Just made these for my boyfriend and I and they are BEYOND DELICIOUS! I only had pork on hand so I halved the recipe and they came out great still. Thank so much for sharing! 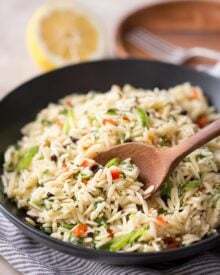 Would this work with just the ground turkey? I don’t eat a lot of pork. 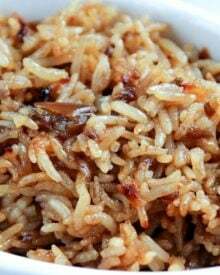 Hi Cyndi 🙂 I think it would, although you may need to add a touch of olive oil or another fat, otherwise they could be too dry. I just made this and tasted the finished product. I love the flavor, think i’ll add a bit more maple syrup. It is a bit dry though. Should I add some olive oil or what should I add to make it more moist and have it hold together better? Hi Genie 🙂 Hmm, mine isn’t usually dry… maybe add a touch more maple syrup, or some olive oil, and you could add an egg to help hold it together better if you’d prefer. 1. Don’t cook it so long. Pork does not have to be cooked to death to be safe. 2. Use fattier meat. If you use lean turkey and lean pork the sausages will be dry. My family loves breakfast sausage, but we don’t serve it very often because it’s usually so fatty. Love this lightened-up version! Oh my gosh! My girls would go nuts for this! Such a great idea! I seriously CANNOT WAIT to try this! Your photos of this sausage look absolutely amazing! I want this on Saturday morning… what a breakfast! And so easy! I’ve never made sausage at home before, but if I’d known it was as simple (and incredibly delicious as this! ), I would’ve. Love this! My boys want to eat meat everyday for breakfast! 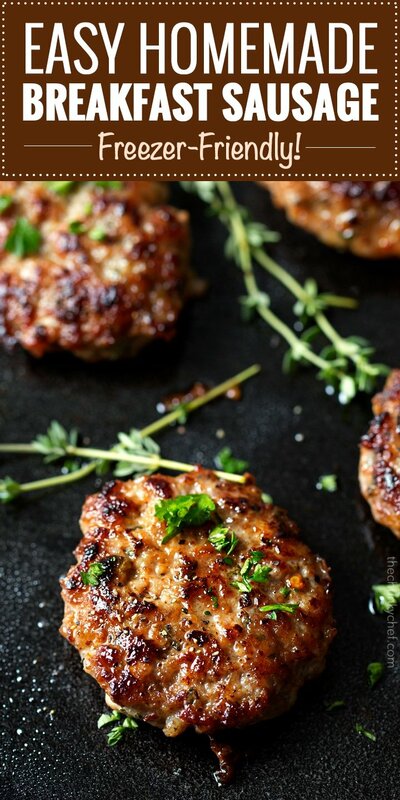 I know they would absolutely love these sausage patties! My boys love eggs and sausage for breakfast but on a school day, it’s tough to make that happen without using the prepackaged stuff that honestly just don’t taste very well. This completely solves my problem. Pinning!! Thank you! !